Love, connection and a Horse. In the words of Sir Winston Churchill “There is something about the outside of a horse that is good for the inside of man”. Many people experience a strong attraction towards horses whether they have ever spent much time with them or not and, although some people are fearful of horses, this is often because they sense the power and free spirit of horses rather than seeing them as intrinsically threatening. Horses have been a part of life, myths and dreams for eons and are archetypally considered to represent power, freedom and the ability to travel. They are specifically developed physically so that they can run fast and have keenly developed social inter-relationships that support the herd as much as the individual. They have highly tuned senses and the ability to communicate by subtle signals as well as much larger actions. Horses are very attuned to their environment, and are particularly sensitive to changes in that environment. Horses have much to teach us human beings in terms of developing our awareness of our surroundings and fine tuning the signals we give out to and receive from others. They can provide feedback, in a non-judgemental, non-biased way, when we are being authentic and clear in the messages we are sending, when our words and actions are in alignment – or when they are not! Increasingly, the potential for self-awareness, personal development and healing through working with horses, is being recognised in many areas including supporting children with learning difficulties or behavioural problems; helping people manage post traumatic stress; enabling people to understand themselves better and gain self confidence and self leadership. Horse based experiential education is also being included in corporate team building activities. Time spent with horses creates a connection back to nature and that helps people to feel calmer and emotionally lighter. In 2014 I walked across England with my horse Lottie and was struck by the power of that experience in helping me connect with myself and with other people. I realised then the potential that walking with horses could have to help people take some time out from busy lives, to slow down and connect with another being. Horses act as powerful mirrors reflecting back to us our state of mind and body – if we are muddled or impatient in our actions they will not be willing partners and will remain somewhat aloof until we are calmer and more clear-headed or focused about what we want to do or achieve. This parallels much of our lives and relationships but the feedback from humans around us can sometimes be hard to take or we feel judged or misunderstood. Horses have no agenda other than to feel safe and peaceful. The heart generates the largest electromagnetic field in the body – up to 60 times greater than the electrical activity of the brain. Magnetic signals generated by the heart have the capacity to affect other people and animals. A person’s emotional state is encoded in the heart’s magnetic field and is communicated throughout the body and into the external environment where it can be measured several feet away from the person. Horses have slower heart rhythms than people but stronger electromagnetic fields so when people are in the presence of horses the heart-to-heart connection enables the human heart to slow down and a greater sense of well being to develop. 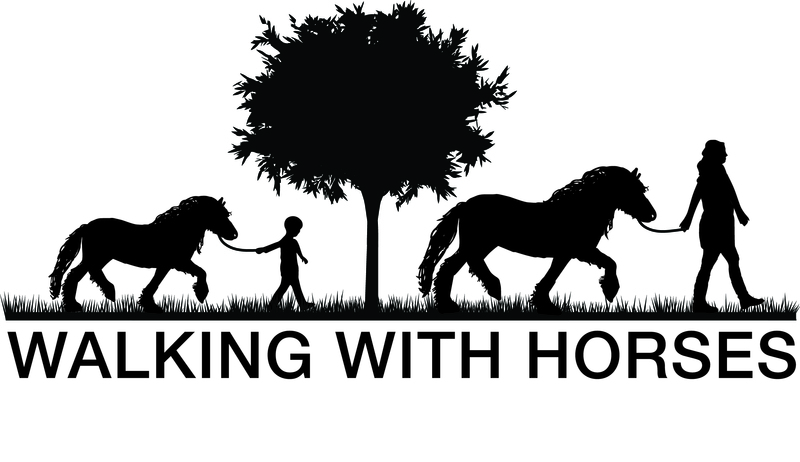 “Walking with Horses” is not about riding horses but about connecting with the wisdom inherent in horses and becoming open to the mirror they offer so that we can learn more about ourselves and our individual and unique place in the human herd. A “walk” can be anything from watching the horses across a fence to grooming them or leading them around an obstacle course within their paddock, or, for the more adventurous, a walk along the lanes and tracks locally with tea and cake to finish. However we spend time with horses it offers opportunities for reflection and increased self awareness and I am able to facilitate and encourage that self exploration with questions and observations using, among other tools, a five question model developed from Pfeiffer and Jones’ work as taught by The Equine Experiential Education Association (E3A).